06 | November | 2014 | Coyote Moon, Inc. Introduced with OS X 10.5 (Leopard), Time Machine is an easy-to-use backup system that has probably prevented more Mac users from losing sleep over lost work than most other backup options combined. 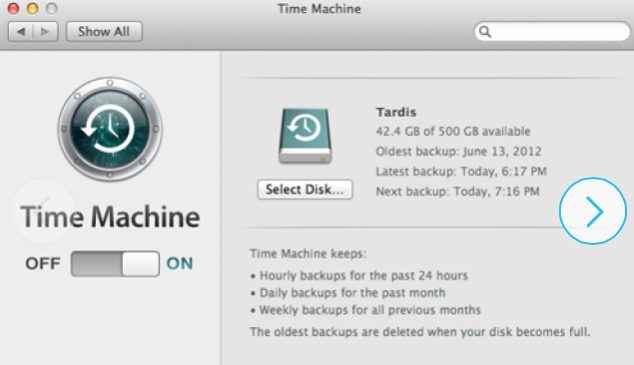 With the introduction of OS X Mountain Lion, Apple updated Time Machine to work more easily with multiple backup drives. You could use Time Machine with multiple backup drives before Mountain Lion came along, but it required a good deal of user intervention to make everything work. With OS X Mountain Lion and later, Time Machine retains its ease of use while providing a more robust backup solution by allowing you to easily assign multiple drives as Time Machine backup destinations. The primary benefit comes from the simple concept that one backup is never enough. Redundant backups ensure that should something go wrong with one backup, you have a second, or third, or fourth (you get the idea) backup from which to retrieve your data. The concept of having multiple backups isn’t new; it’s been around for ages. In business, it’s not uncommon to have backup systems that create two local backups that are used in rotation. The first may be for even-numbered days; the second for odd-numbered days. The idea is simple; if one backup goes bad for any reason, the second backup is only a day older. The most you would lose is a day’s work. Many businesses also maintain an off-site backup; in case of fire, the business won’t lose all of its data if there’s a copy safe in another location. These are actual, physical backups; the idea of off-site backups long preceded cloud computing.